Beyond the kickbacks and pressure from the powerful and well-funded medical lobby, the U.S. Chamber of Commerce and other special interests, there’s a crucial reason why Congress won’t repeal Obamacare. It’s because Congress is not affected by it in the least. After the (un)Affordable Care Act was passed, Congress realized it had lost its gravy train of subsidized health insurance. This made congressweasels and their staffs unhappy. So some administrative hocus pocus was employed to create a new subsidy. Congress was named a small business that employs fewer than 50 people. It is not a small business by any definition, and it employs far more than 50 people, but the administrative mumbo jumbo created an exemption which allowed the employer (government) to subsidize its employees’ (congressweasels and their staffs) health insurance and purchase it off the business exchange rather than the individual exchange. Obamacare’s rising premiums and deductibles and fewer options and lesser care are killing the middle class. 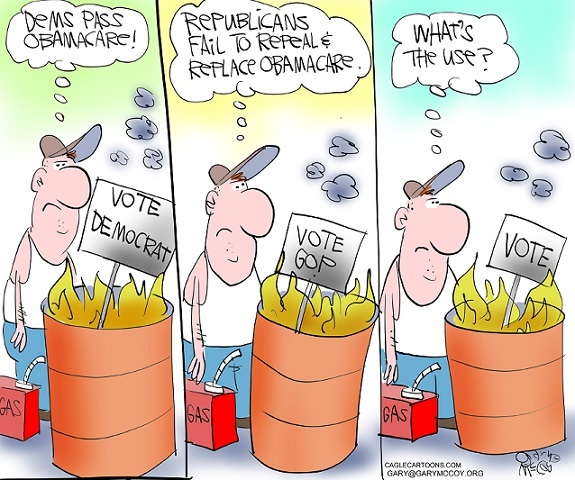 But it’s having no effect on congressweasels, who care far more about lining their own pockets through massive subsidies to insurance companies than worrying that Obamacare is bankrupting their constituents. But it gets worse. Congressweasels don’t have to go through the effort you do to find a doctor that is taking patients and accepts the insurance you have. They get premium care through their own secretive and private Office of the Attending Physician (OAP), an elaborate medical clinic where Navy doctors triage medical emergencies and provide basic health care for lawmakers who pay an annual fee of just over $600. The OPA was budgeted $3.6 million in 2016, which covers the “free” care they get all year after paying the nominal fee, which is far less than most people are now paying for a monthly Obamacare premium. The OPA is served by the oldest community pharmacy in Washington, D.C., which has operated continuously since 1876. The pharmacy provides as many 100 prescriptions a day to the OAP to treat members’ ailments. But the owning pharmacist assures us congressweasels get no special perks – beyond hand-deliveries – and their insurance is charged the same fee for prescriptions as other customers. Among the pharmaceuticals sent to the OAP for congressweasels are medications to treat Alzheimer’s disease and diabetes. That’s not surprising given that the average age of a congressweasel in the House is 57 and in the Senate it’s 61, with several in the late 70s and 80s. And Insane John McCain, who regularly advocates for wars around the globe and cast a deciding “no” on the last phony Obamacare “repeal” effort, is taking drugs for brain cancer. This serves as further proof of something I have written many times; that congressweasels – and their staffs and the federal judges and even the president and his cabinet — are all employees of government. That’s where their paychecks come from, and that’s why they rarely if ever legislate or rule against government. And it’s why Obamacare won’t be repealed unless it’s replaced with another scheme equally or even more nefarious. The Medicaid and Medicare markets are increasingly driving insurer topline growth, and that is where the plans are setting their sights on expansion. Aetna now derives more than half of its revenue from government plans, and after abandoning its merger deal with Humana, the insurer is focused on growing its Medicare Advantage market share on its own in 2018 and 2019. “The general trend is growing the portion of health care claims that are directly or indirectly paid by the federal government,” said health care ratings analyst Deep Banerjee, a director at S&P Global Ratings. This entry was posted in Power Of The State and tagged Big Pharma, Congress, Obamacare. Bookmark the permalink.